Too many managers fail. Joyce Hogan, Robert Hogan, and Robert B. Kaiser reviewed a dozen studies of consistent management failure. The studies showed ranges of managerial failure from 30 percent to 60 percent. You don’t have to fail. Being a boss is a different kind of work than whatever you’ve done as an individual contributor. That’s why getting promoted is more like a career change than a job change. And you can form habits in the first few months difficult to undo. Your company may not be much help. Many managers get no training at all. Others don’t receive training until they’ve already formed bad habits. Even worse, much leadership training is ineffective. Hardly any companies provide special support during the transition when coaching and peer support can make a big difference. It’s up to you. Now You’re the Boss will help you learn how to be a great manager. You’ll master important learning skills that will help you for the rest of your career Here are just a few things you’ll learn in this short ebook. Why some managers lose their way during the transition and become bad bosses. Why the transition is so difficult. It may not be what you think. How to overcome the challenges of the transition. Where to find the insight and ideas that will make you a great boss. Research-proven principles of motivation that will help you make your team productive. 10 things you must do to succeed as a manager and which ones are most important. How to learn from experience, a vital skill that will make you successful throughout your career. How to get the most from your reading. Your transition to your first leadership job sets the tone for the rest of your career. 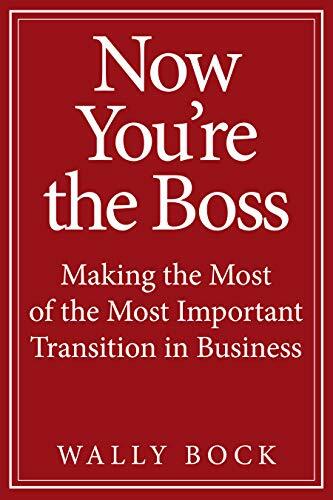 Buy Now You’re the Boss for just $3.99 and take the first step toward becoming a great manager and having a great career.